These two rare photos were taken near the Santa Fe Railway Depot, New Mexico. Rudolph Valentino was walking his dog while the train stopped to pickup/drop off passengers. Agnes Ayres died 25 Dec 1940, in Hollywood of a cerebral hemorrhage and her body was cremated interment was at Hollywood Forever Cemetery. Legend has it that her family disowned her after she appeared in silent pictures. Beverly Rendleman, Alto Pass, Illinois and a family genealogist has found the opposite to be true. “Her family was very supportive of her moving to Hollywood once came from California in her own private railroad car to visit he cousins May Rendleman Hammer and Frankie Rendleman McClure of Murphysboro. “She remained very close to her cousins often sending them her clothes she no longer wore” When Frances Alice the 17 year old daughter of May Hammer was killed in the 1925 Murphysboro tornado, she was buried in a dress provided by Ayres, Rendleman said. In contrast to the throngs her name once drew when she co-starred with Silent Film Star Rudolph Valentino. Agnes Ayres a star in her own right was mourned by a small crowd at her funeral service late yesterday. At her funeral there were only ten floral pieces, and of these only one was from the movie colony. A spray from the Screen Actor’s Guild. The “Kashmiri” song from Valentino’s picture, “The Sheik” in which she played the heroine and “Son of the Sheik” was played during her service. Miss Ayres ashes were laid to rest near those of the great Latin star at Hollywood Forever Cemetery. Maria Reachi daughter of Miss Ayres, was the only relative present and only three were connected with the business in which her name had become a household word. Once a wealthy woman, Miss Ayres lost her fortune in the stock market crash of 1929 and died in obscurity on Christmas Day. Agnes Ayres, 42 who rocketed to movie stardom in the silent screen days, retired to cinematic sidelines when the talkie era started and later made an unsuccessful comeback attempt died Christmas Day of a cerebral hemorrhage. Miss Ayres, a film contemporary of Gloria Swanson and starred opposite of Rudolph Valentino in “The Sheik” had been in failing health for some time. She was stricken suddenly on Christmas Eve and died later in a hospital without regaining consciousness. Surviving is a daughter Maria now reported to be in Mexico City with her father Manuel Reachi from whom the actress was divorced in 1927. Rudolph Valentino loved this time of the year. Here are two examples of Christmas Cards he sent to his friends. 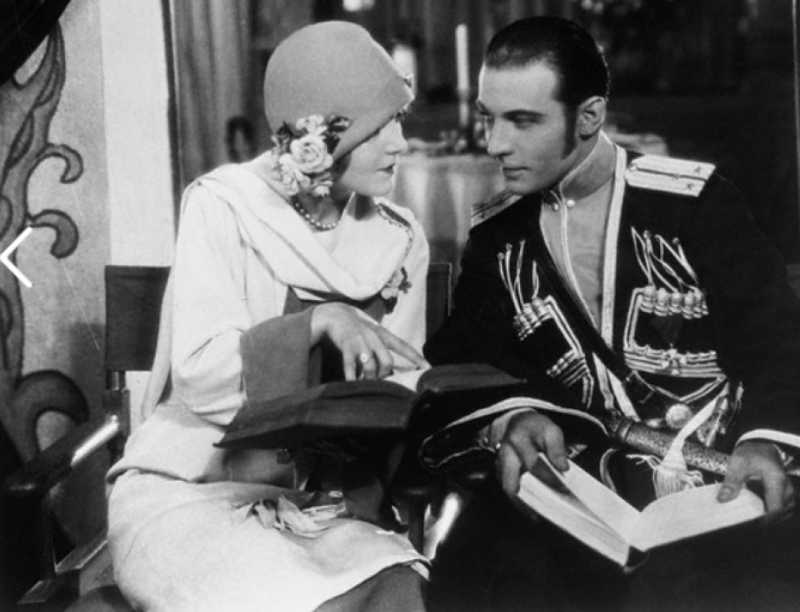 Paris Mrs Rudolph Valentino (Winifred Hudnut) has filed a petition for divorce against moving picture star whose real name is Rudolfo Guglielmi but Valentino today appeared to be unperturbed by the news that the proceedings had reached official form in Paris. He nonchalantly refused to reply to inquirers who had divined his identity, although he was cited under the name of Guglielmi. Valentino dined at a fashionable hotel tonight and after that left with friends to explore the diverting quarters of the capital. Valentino wife’s name was given in the petition of Winifred De Wolfe and was set forth that they were married in Crown Point, IN on 15 Mar 1923. The proceedings here will follow the usual simple and expeditious course when there is no opposition. Mrs. Marion Wilson Watson, 45, who claimed to have been married to Rudolph Valentino, committed suicide on Saturday. Mrs. Watson, a former actress, was a known as Marion Benda on the stage. She made annual pilgrimages to the Hollywood mausoleum where Valentino is buried. She claimed that she and Valentino had been married in 1925 and that she went abroad to bear him a daughter. Valentino* relatives said her story was untrue. Rudolph Valentino has a cottage on the United Pictures lot that is said to have cost $18,000. Here, when he begins work on United he will spend his time between scenes, resting, tea-ing, and possibly reading your letters girls. A bullfighter’s cape, worn by Mr. Rudolph Valentino, has been sent to Sydney, to be placed in the new Capitol Theatre. as a memorial to the late star, after Valentino’s death. His personal belongings went into private hands, but members of the motion picture industry spent a year gathering up his studio vestments. These are now being distributed to tie principal theatres throughout the world.